For hydration and sun protection. Made with organic ingredients. 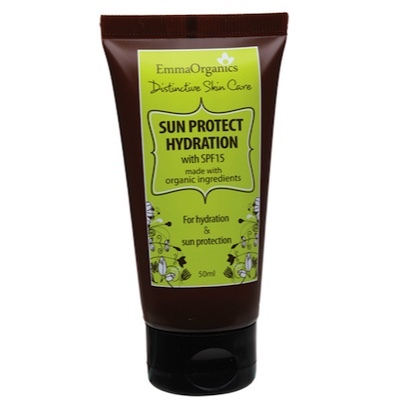 Emma Organics SPF15 SUN PROTECT HYDRATION is a smooth and hydrating cream formulated to moisturise whilst delivering protection against sun exposure and premature ageing. Free from chemically produced sunscreens. Micro Zinc Oxide – protects against UVB and most of the UVA spectrum. Organic Aloe Vera Juice, Zinc Oxide infused in Jojoba oil, Glyceryl Monostearate, Purified Water, Biodynamic Macadamia Oil, Organic Coconut oil, Organic Glycerine Vegetable, Organic Lavender extract, Organic Chamomile extract, organic rosehip extract, Organic shea butter, organic jojoba oil, Locust bean gum, citric acid, organic cinnamon leaf essential oil, Solanum Lycopersicum (tomato) seed oil, Lavender essential oil, organic Rosemary extract, Vitamin E natural, glyceryl caprylate, bitter orange extract.